After going and seeing the most recent Sherlock Holmes movie, I became inspired to read those Sherlock Holmes books that I have sitting around. Side thought here - been thinking if we even get a dog or another cat someday, that lucky animals name might be Sherlock. I like the name but that would just be cruel to get that name to a kid. But anyway, so I decided to take a short little break from Sookie Stackhouse and read book one of Sherlock Holmes and I'm glad I did. 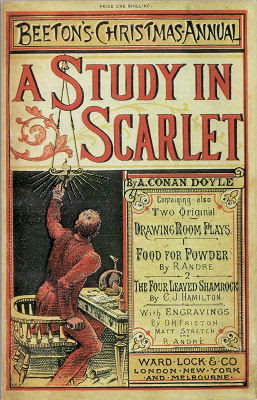 The Study in Scarlet introduces Sherlock Holmes and Dr. Watson. They first met because they were both looking for someone to share the rent with and through a mutual friend they decided to live together. Dr. Watson kept studying Sherlock because he just couldn't figure him out. Finally it is revealed to Watson that Sherlock is called in in on cases when they just can't be figured out. And at that, a case emerges. A man is murdered with no visible injuries in an empty house with no clue to how he got there. The two detectives think they have the case figured out but both of them turn out to be wrong, especially when the dead man's companion turns up dead as well. It is at that point that Sherlock calls a cab and asks the cabman to come inside and help him with his bags and he puts handcuffs on him to the surprise of everyone. During part two, we go into the back story of a man and a little girl who were stranded in the American desert and had resigned themselves to death, when a large caravan of Mormons come across their path and rescue them. 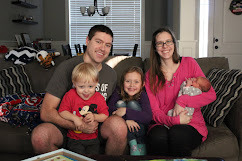 We learn about this man and the little girl who have stayed among the Mormons and we learn that there was a motive to the deaths of these men years later in England. Honestly, I was expecting this book to be harder to read. Aren't all the classics written in England hard to read? Apparently not, this one was a quick read and I really enjoyed reading about Sherlock. Sir Arthur Conan Doyle definitely made the book easy to read and enjoyable. And I look forward to reading more Sherlock stories.